Fortunately, these snails are not in my garden! This is the fourth month of my Cottage Charm BOM from the Quilted B. They were paper pieced and I had a lot of fun making them! 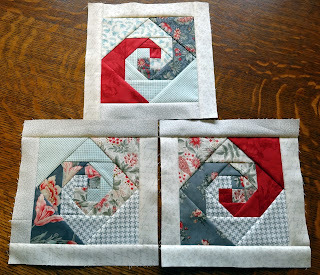 In fact, the more I do paper piecing, the more I like it. I may just add this quilting method to my permanent repertoire! Speaking of gardens, it may still be winter on the calender, but the primroses and winter pansies under our Dogwood trees look like this! 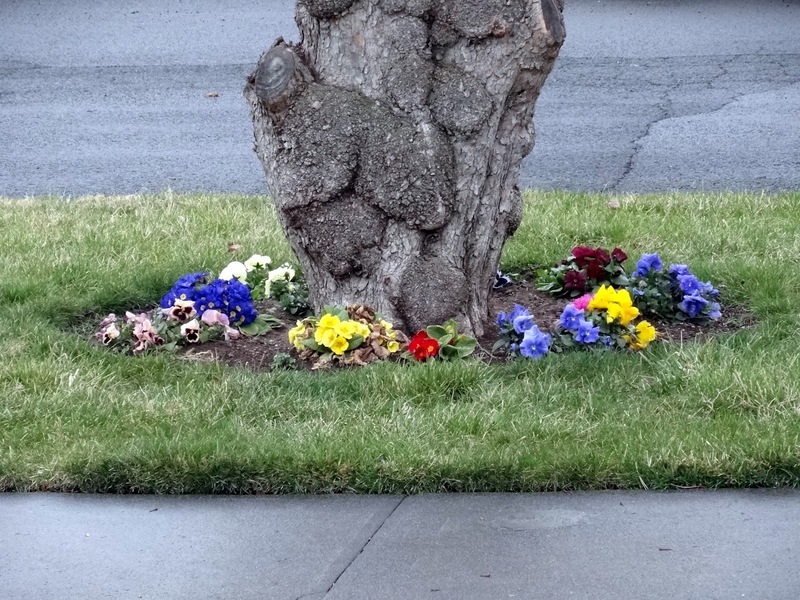 In fact, many of the primroses bloomed all winter long -- something unheard of when we lived West of the Cascade Mountains! I just received Block 5 for the Cottage Charm sampler, so with any luck I'll get it made over the weekend and show you the finished block on Monday! Have a great weekend! Spring is bursting out all over around here. Woo Hoo! I love snail's trail blocks and yours are very pretty. I dislike paper piecing. We have daffodils and crocuses in bloom already and birds are wanting to nest! It's crazy. Nice blocks and a lot of cutting! Your Spring flowers look so pretty and colourful - all we have is whiteness. Love your snail's trail blocks, Candace. We had 5" of snow yesterday but it's quickly melting today. No pansies here yet but the robins are having a feeding frenzy in our backyard. Love your blocks ! I have become a great fan of paper piecing this last year ! Glad you are enjoying it too ! Cute blocks. I think with that block paper piecing is the way to go. 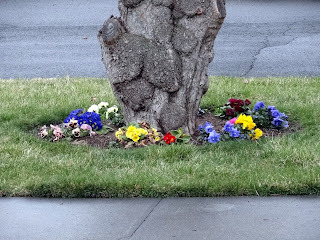 That looks like an old dogwood from the trunk. Very pretty flowers. Great blocks. When I start seeing primroses then I know it is properly Spring. Snail's Trail has always been a favorite of mine.. I think your snails made it down to my house! Those are beautiful blocks. I haven't yet tried any paper piecing in my 2 1/2 years as a quilter, but those are indeed tempting. Your spring flowers are beautiful! Here in southern Calif we just had a rain/snow storm on Saturday, but now 4 days later we're enjoying temps in the 70's. Ha! Third Times a Charm Fabric Sale! Block 5 Done & March Snow!